Are you looking for the entertaining game, Oregon Trail Deluxe? You can download it for free here. In Oregon Trail Deluxe you'll have the chance to experience the journey, which settlers in America were on back in 19th century, first hand. You'll pass through The Rocky Mountains, which as you probably know is beautiful and impressive, but also a dangerous place, where you'll have to watch out for dangerous animals. At the same time you need to do a little hunting yourself to survive the journey. The catch can also be used to trade with. In this way you can obtain important tools, which can be used on your journey. In Oregon Trail Deluxe you'll be rated on the basis of how many money you'll have, when the journey ends, the number of survivors etc. This is a really entertaining game even though it's old and abandoned by now. If you get hooked you should also try the sequel called The Amazon Trail. 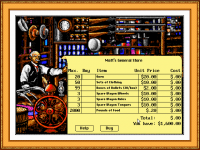 Find Oregon Trail Deluxe, mark it and choose "Uninstall"
Should Oregon Trail Deluxe has been damaged or corrupted and thereby difficult to remove we can recommend you finding help to uninstall it here.